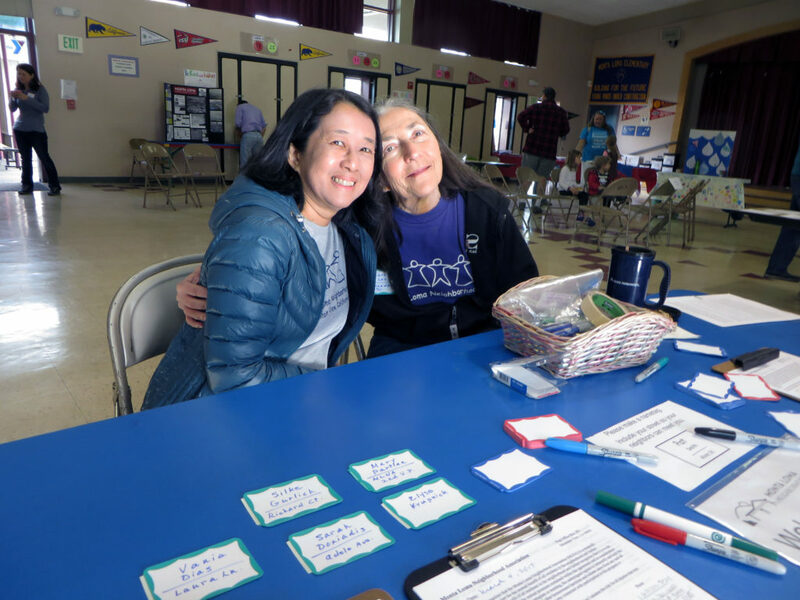 With all the tables and chairs in place, Maria Harnoto and Carolyn Len were ready at the welcome table to sign in the exhibitors at 9:30. 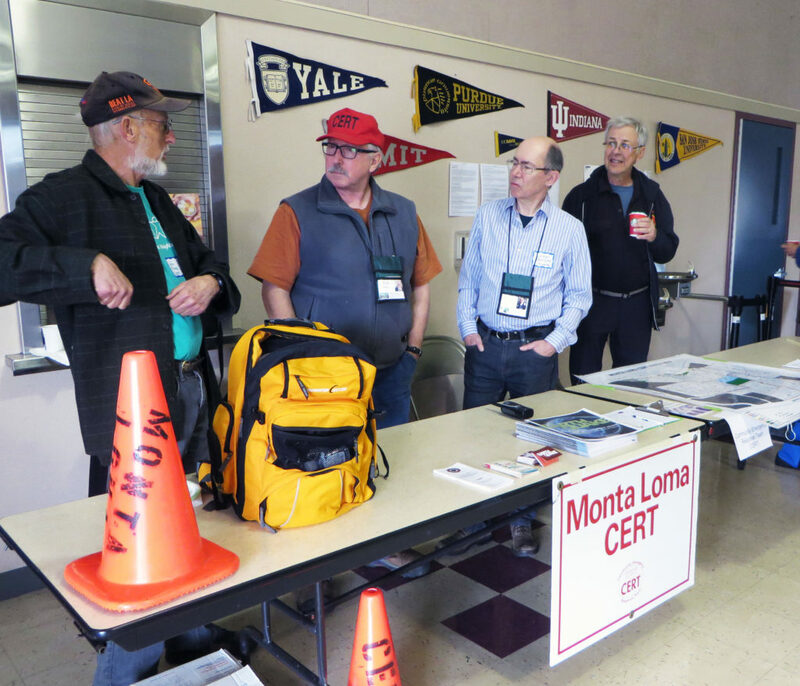 John Thomas, Tim Slattery, John Partlan, and Kaj Rekola were ready to explain CERT to their neighbors. 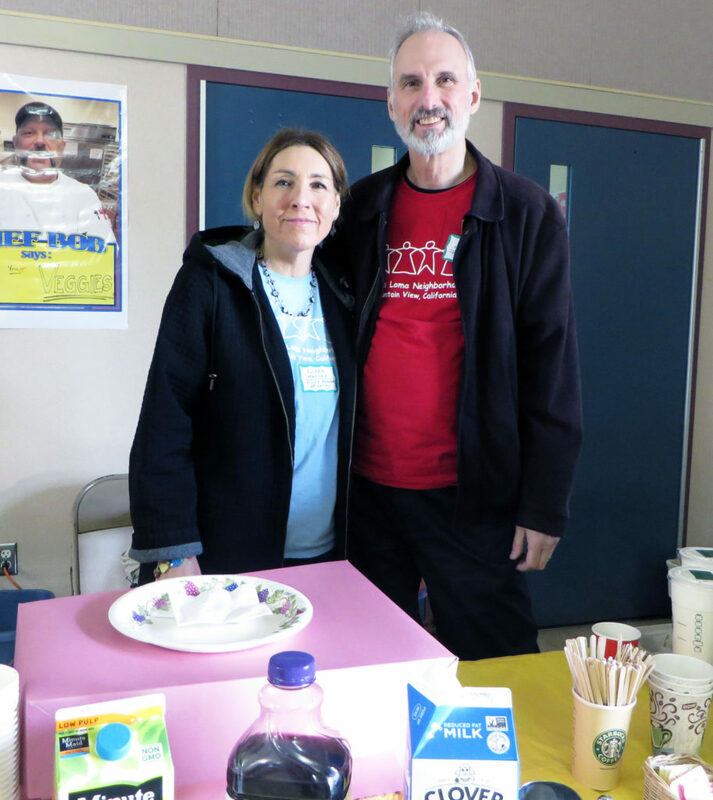 Pat & Linda Harvey had first shift at the refreshments table. 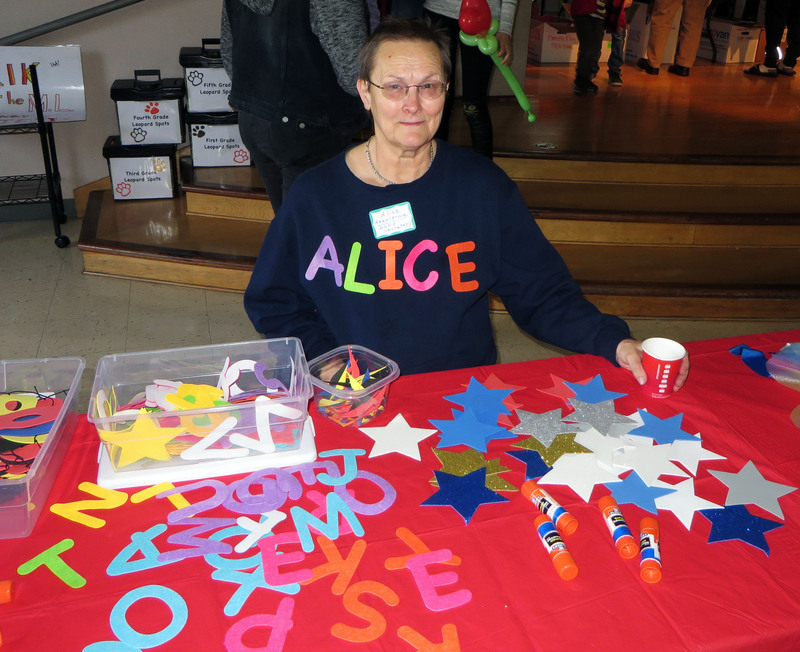 Alice Hazelgrove helped kids decorate superhero capes and masks while their parents chatted with their neighbors. 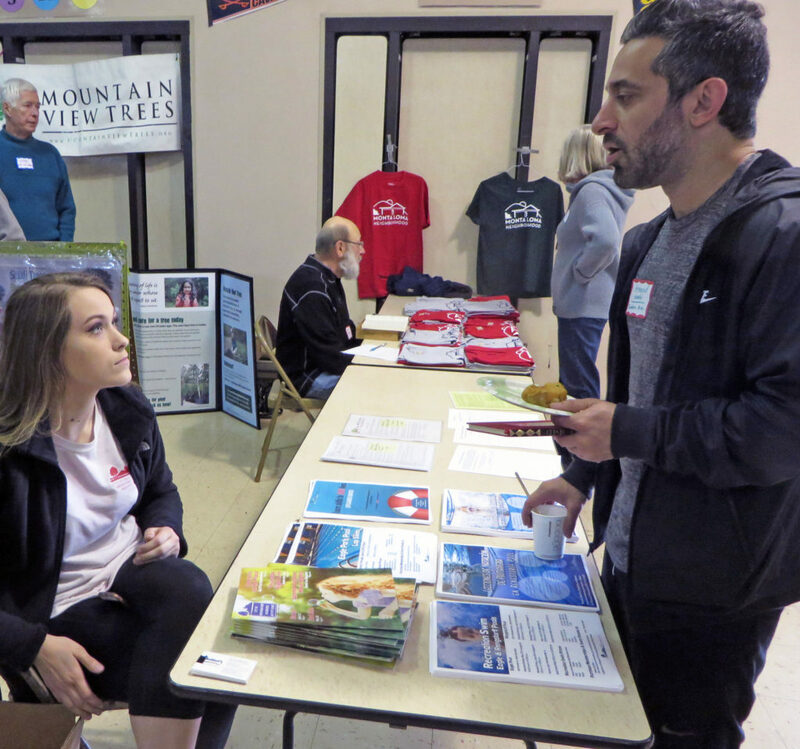 Tim Slattery consulted Steve Bobay of MV Trees. In back, Natasha Drosdova offered city information. 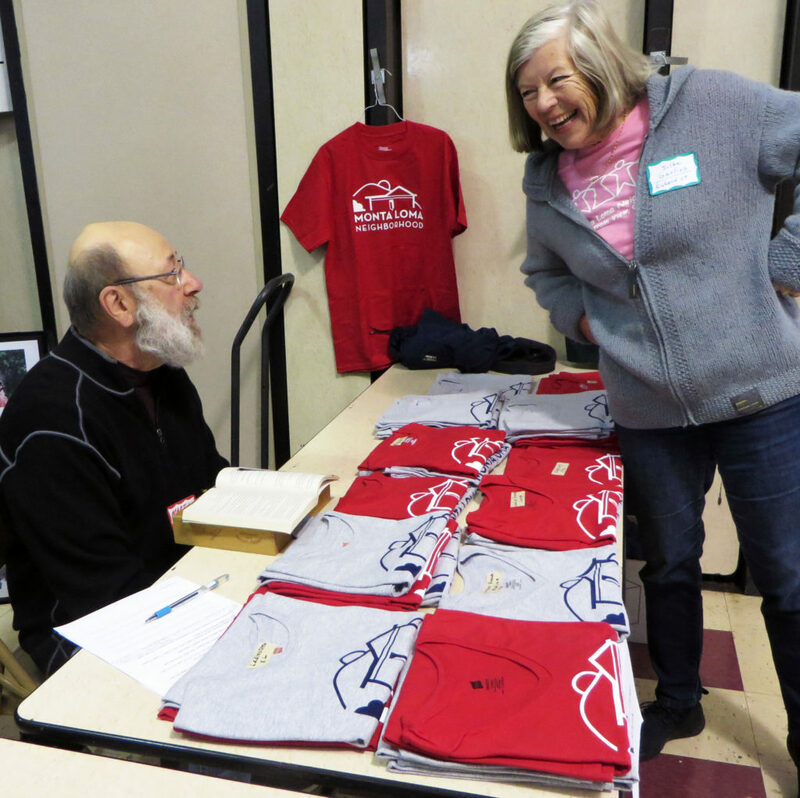 Marty Pulvers can’t sell Silke Gurlich a tee shirt because she already has one. 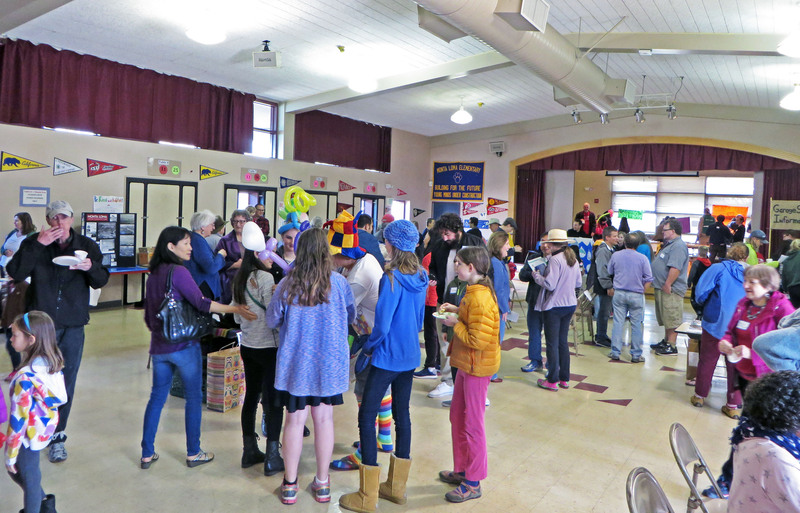 “Gizmo Gary” Heyman’s balloon creations attracted the younger attendees. 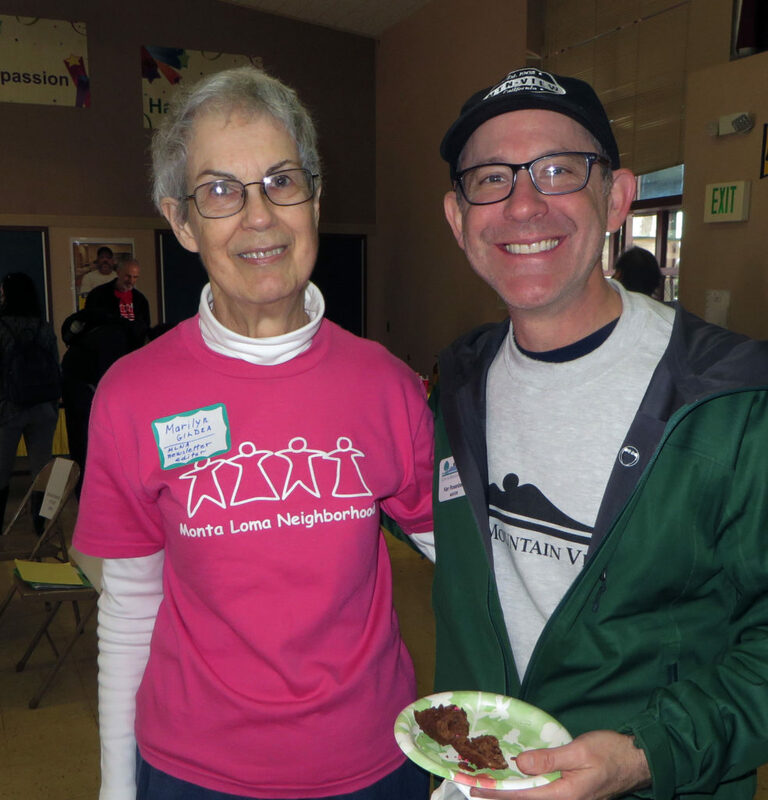 City council members Lisa Matichak and John McAlister chatted with our neighbors. 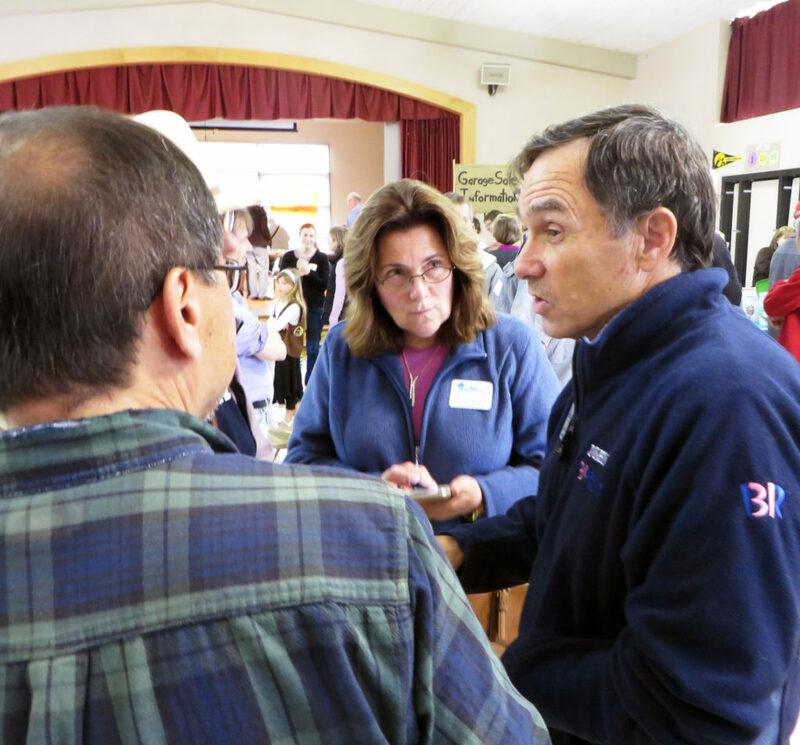 Mayor Ken Rosenberg came, too. 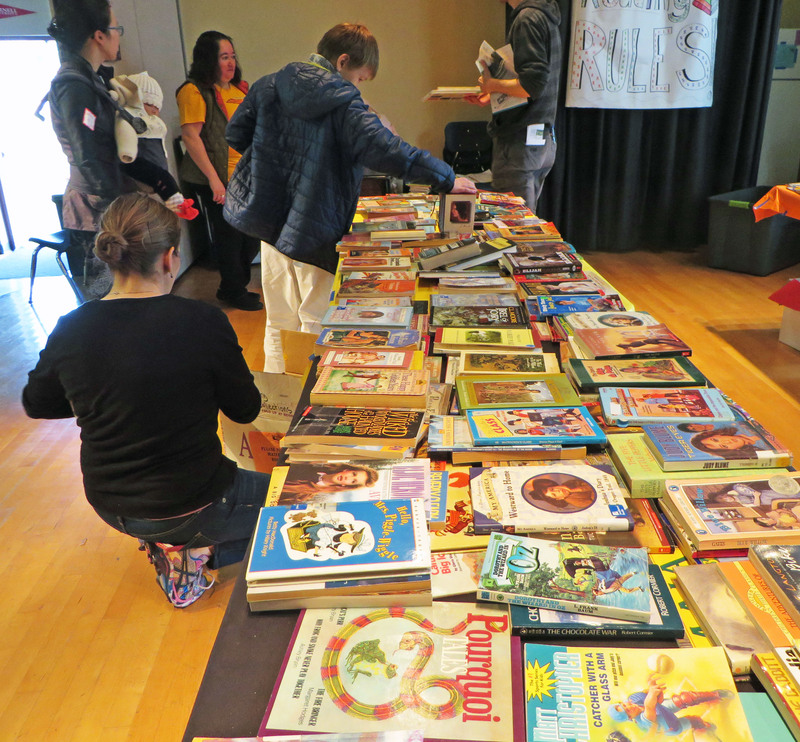 The PTA’s used-book sale on the stage was an added attraction. 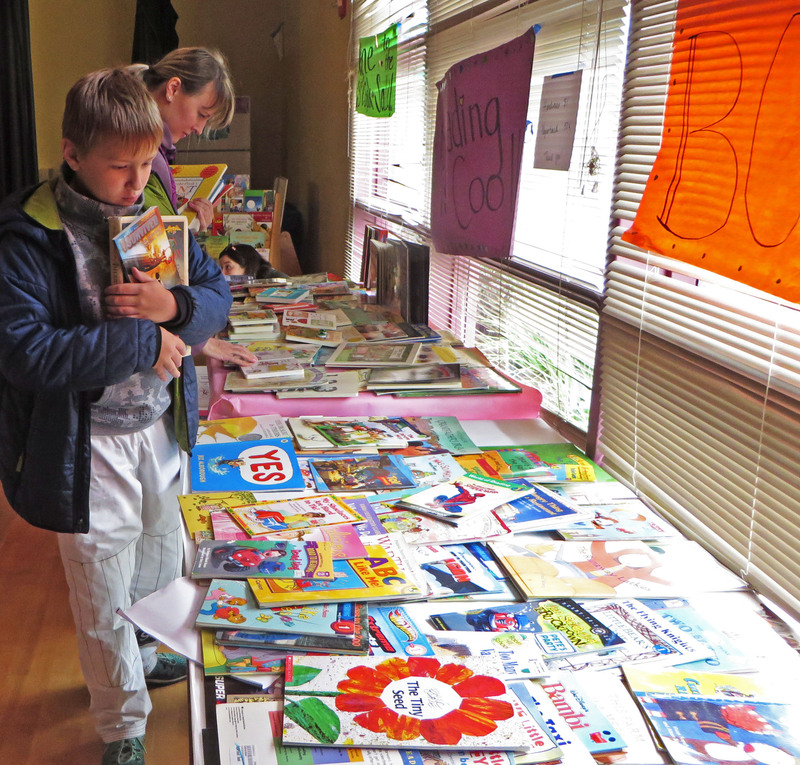 Several tables – and arms – were full of books. 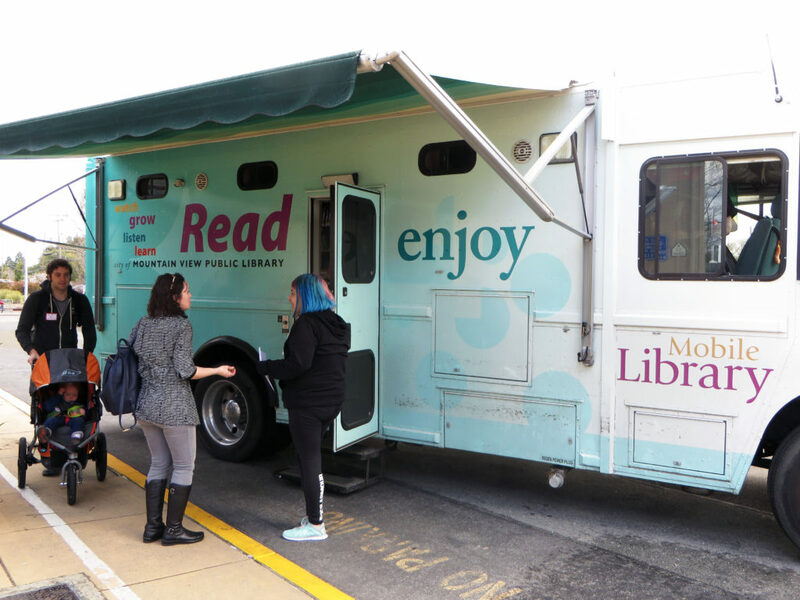 More books were available in the bookmobile, which stopped by for an hour but stayed almost two. 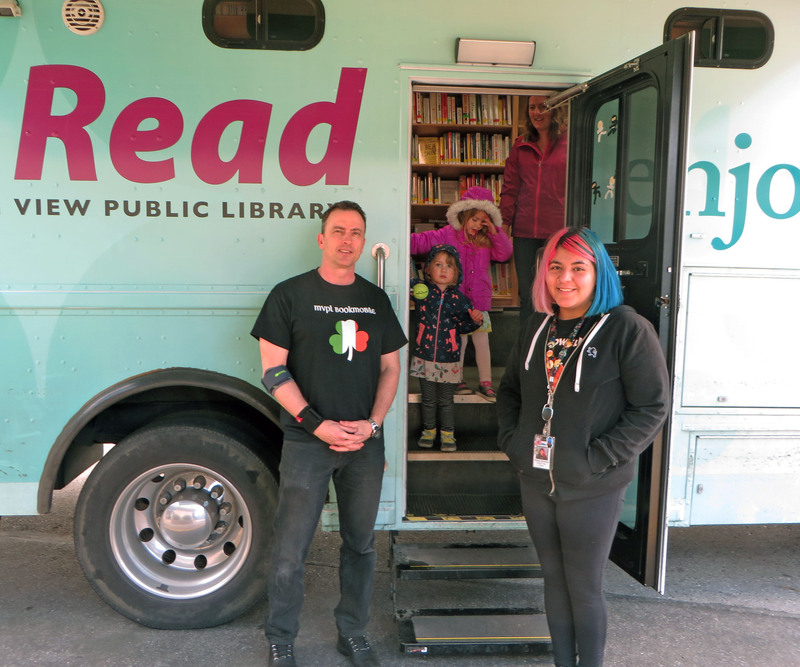 Bookmobile librarians Cody and Diana reported that they had 62 visitors, and checked out over 60 items. 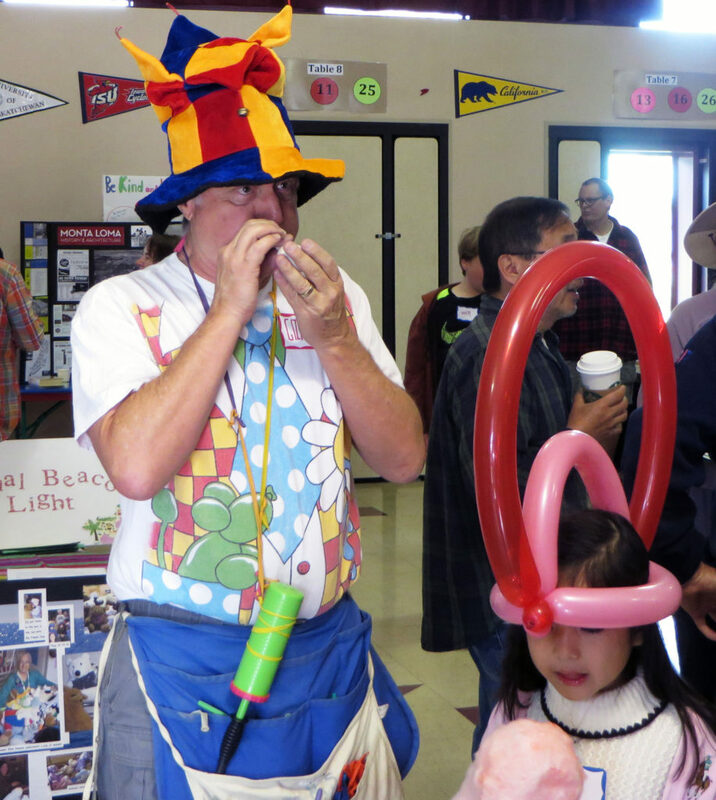 “Gizmo Gary” Heyman made balloon crowns, among other creations. 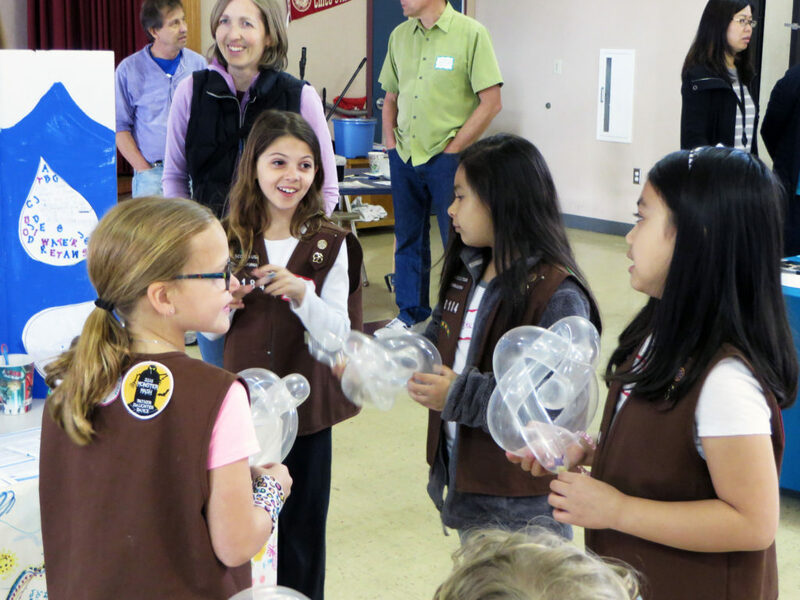 The school’s Brownie and Daisy Scouts showed what they’d learned about water. Katie Purcell is one of their leaders. 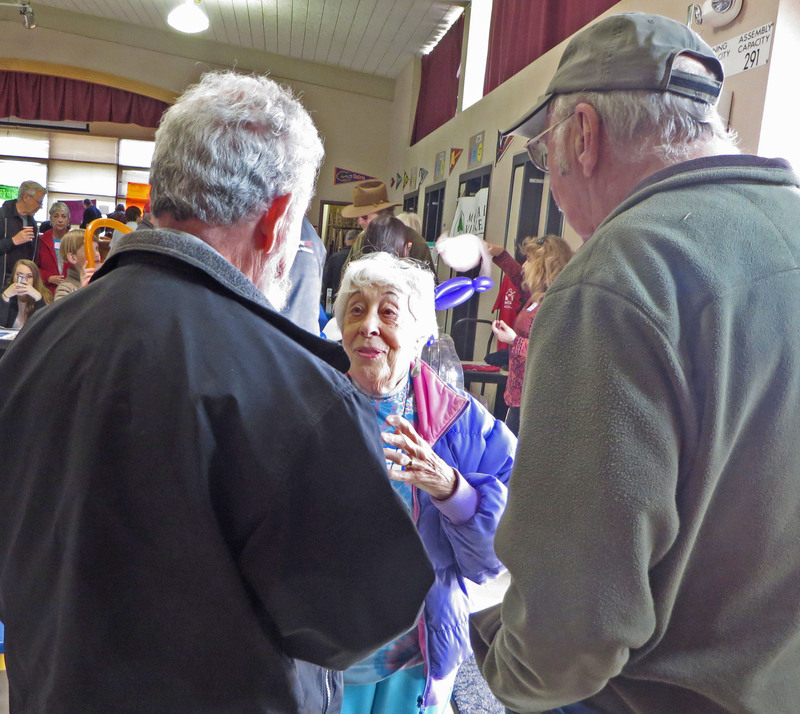 Joan MacDonald chatted with neighbors. 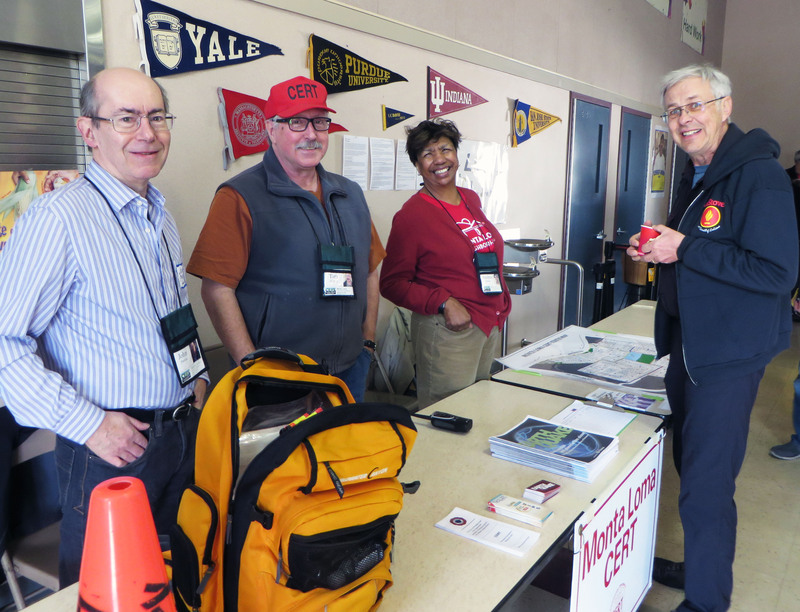 Andrea Thomas joined John Partlan and Tim Slattery behind the CERT table. 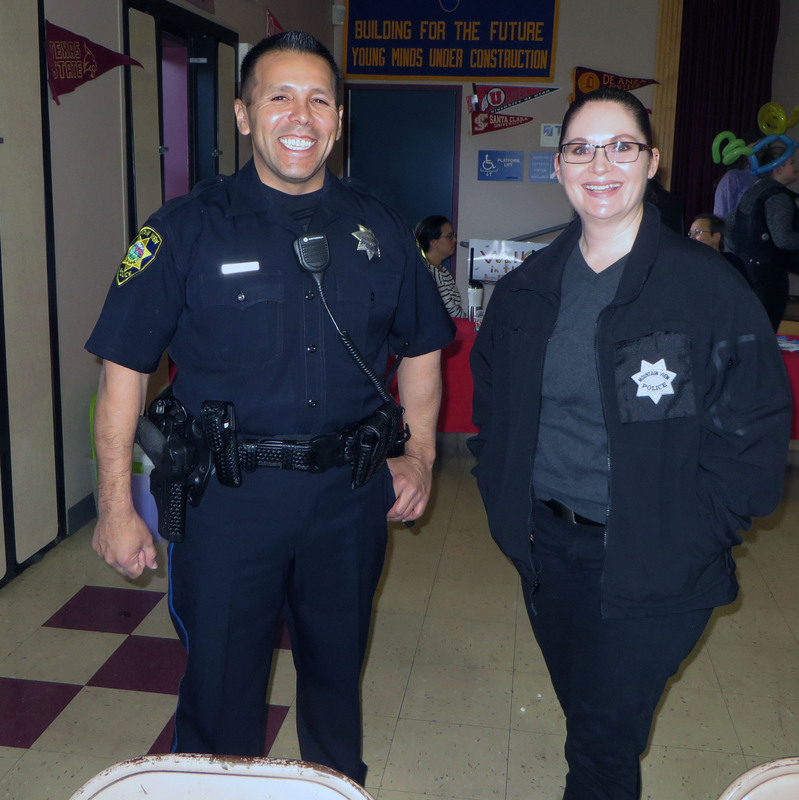 Detective Garcia and Jodie Pierce represented the MVPD. 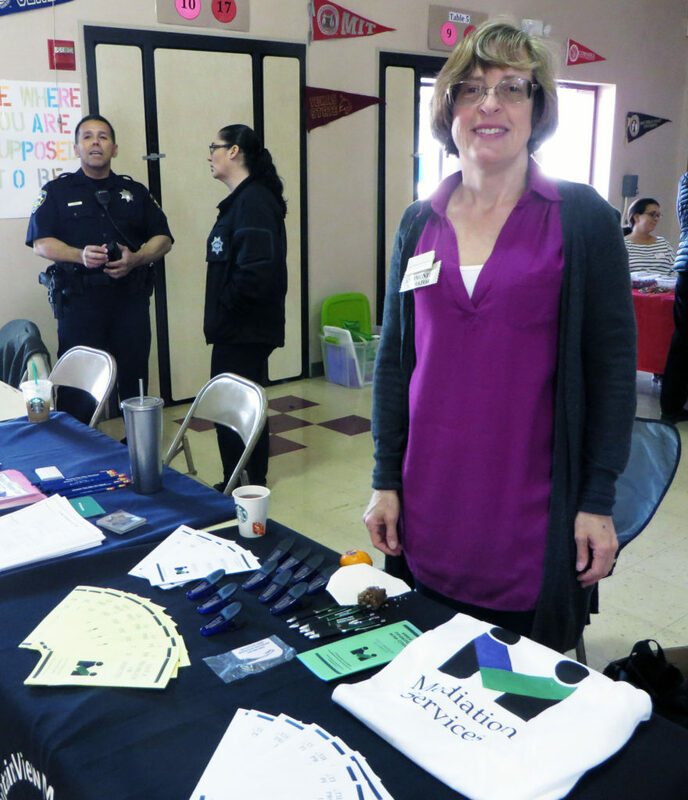 Lori Abrahamsohn explained the MV Mediation Program. 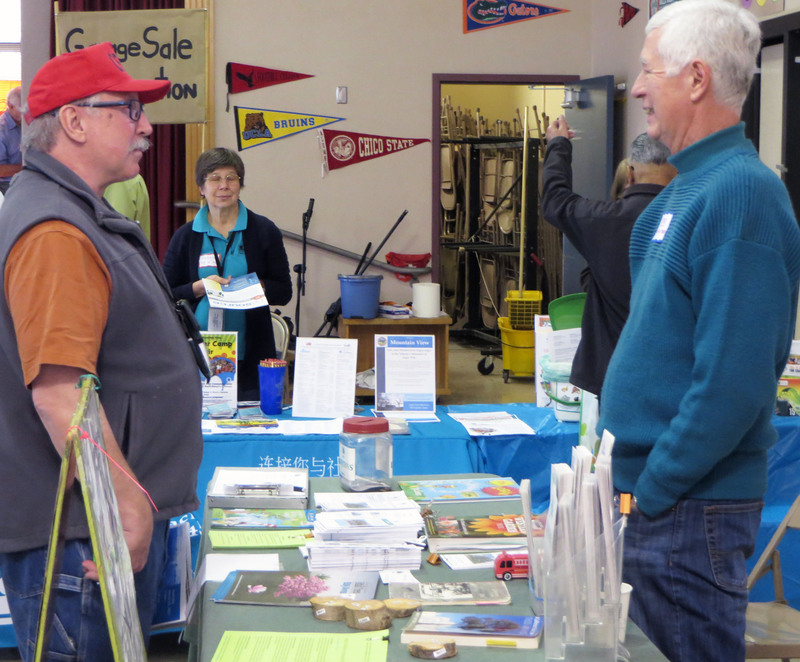 The Recreation Department sent a member to explain the aquatics program. 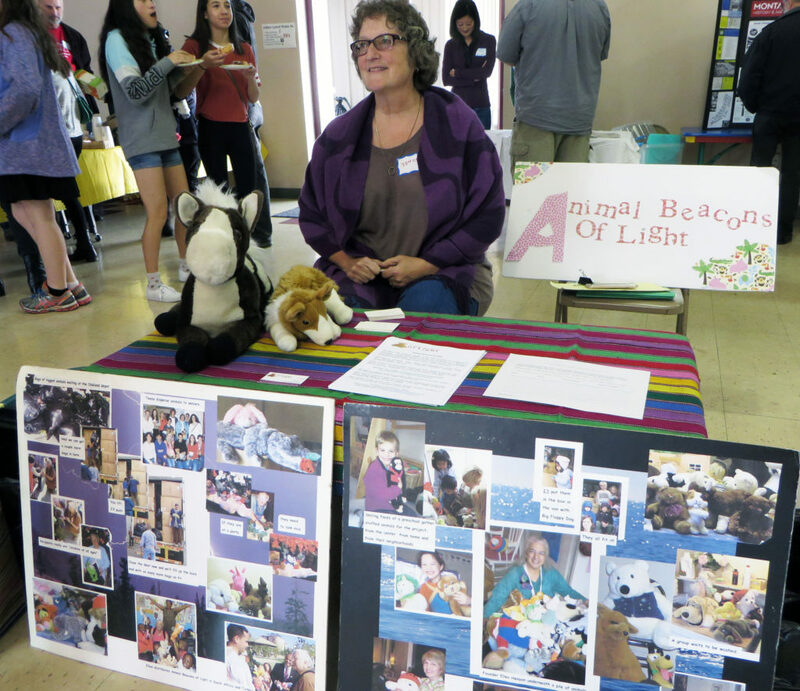 Jenise Dormann accepted donations of stuffed animals. 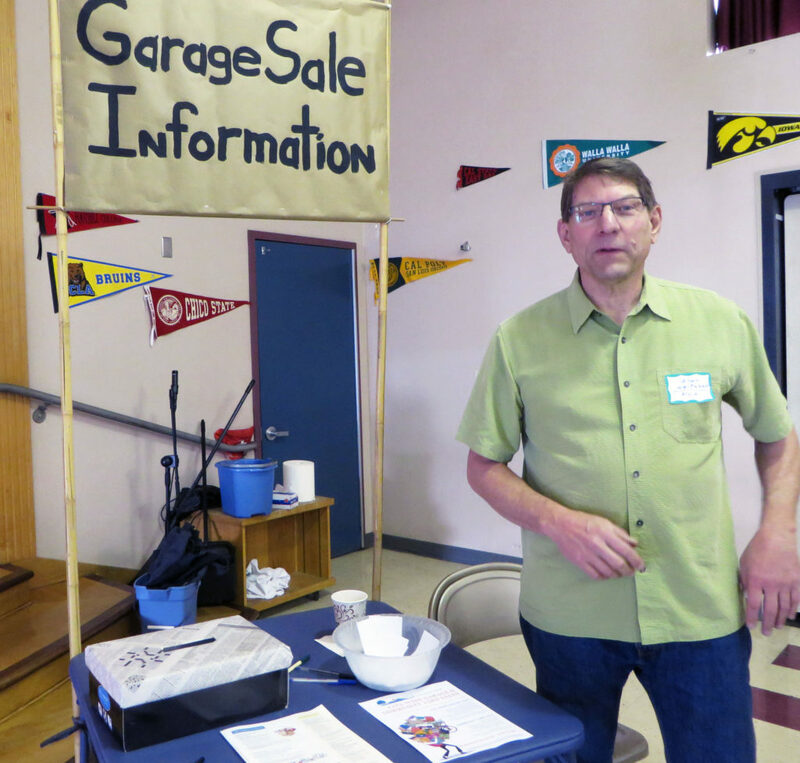 Alan Whitaker solicited interest in garage sales, both the city’s and for Monta-Loma-only. 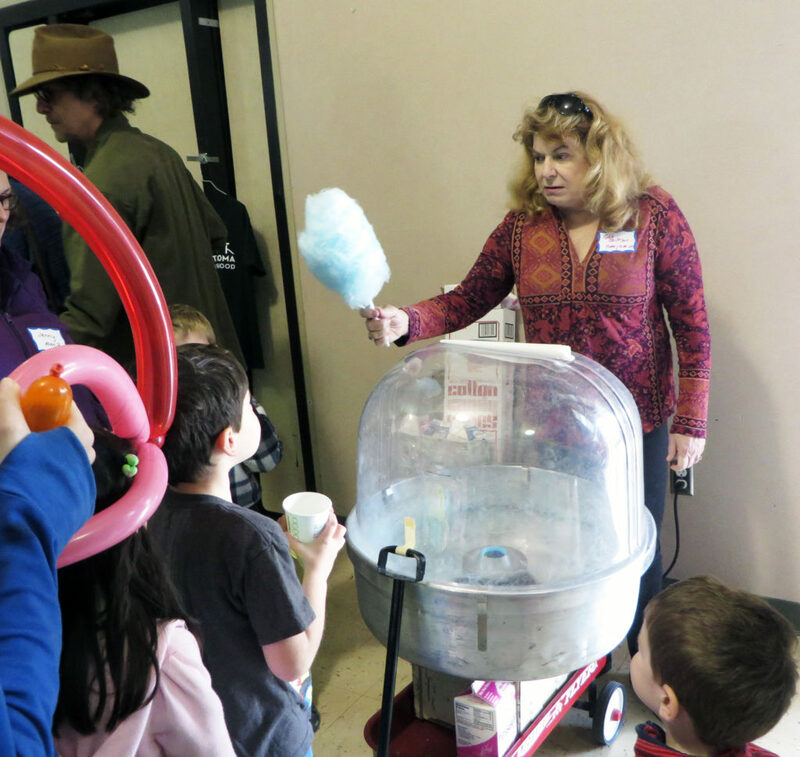 Gloria Jackson brought her cotton candy machine the second hour.